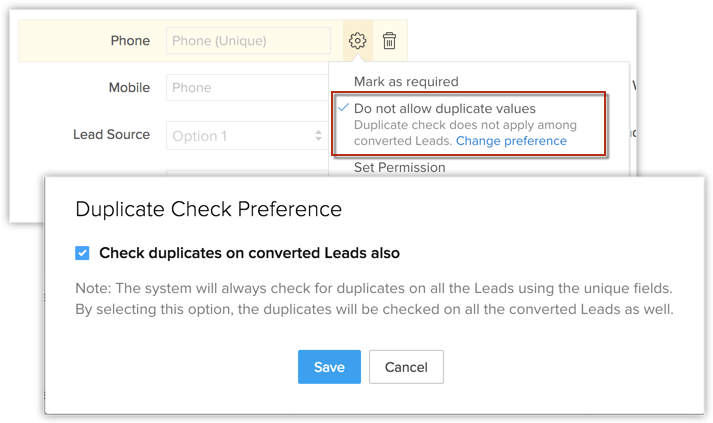 Run duplication check across converted leads. When you mark fields as unique in CRM, you can enable duplication check within Converted Leads as well. Consider a scenario. A sales rep in your organization has just followed up with a bunch of leads obtained from a recent tradeshow and converted them to accounts and contacts. Now another sales rep who has no knowledge of this, by mistake, imports the same tradeshow list into the Leads module. Since these names are now in the Contacts module and no longer in the Leads module, CRM will allow the import. But in reality, it still amounts to record duplication, as these leads have already been followed up with and converted. In order to avoid the duplication that occurs this way, you can enable duplication check across converted leads as well.